We’ll just put it to you as simple as it is; you’re missing on so much fun if you haven’t tried stand up paddle boarding yet. Summer is right around the corner and there is nothing better than a good looking inflatable stand up paddle board that you can take with you anywhere that has water. Now since you’re here, you are either looking for a new iSUP or you’re trying to find your first board ever. Well, either ways, this is a good place to start because the SereneLife Premium is one of the boards that we’ve reviewed before but here it is today with a total upgrade to serve you just right this summer. In this review, we’re going to break it down to you to see and have an idea about the SereneLife Premium iSUP which there’s no way you’d be going wrong for settling with it; it comes in a great package and it offers a versatile performance that’ll please many of you out there. The SereneLife Premium iSUP is your standard board that’s guaranteed to do everything that’s expected from it. I say standard because it’s 10 feet and 5 inches long, 30 inches wide and 6 inches thick. Don’t get me wrong though; ‘standard’ here stands for a board that can offer what many other boards all combined can because the dimensions here are perfectly suited to be flexible and all-around. Let’s take a moment and talk about width; 30 inches is the usual which any decent brand could offer and that’s a number that brings balance to the table. The SereneLife feels roomy enough for anyone to stand, sit or lie down very comfortably which make it one of the most suited iSUPs for beginners. However, the fact that it is 10.5 feet long might not be so appealing to large paddlers. Still, the SereneLife can take up to 275 lbs to handle a fully grown adult plus some cargo. What adds up to the value and performance of an iSUP here is definitely thickness; this is a 6 inches thick iSUP that can handle maximum weight capacity without flinching or flexing at the center under your weight. All in all, the SereneLife Premium is an all-around iSUP that’s capable of keeping you safely and smoothly afloat in all comfort and functionality. Now in addition to good dimensions and measurements, a good board is also a well-built one. The SerenLife didn’t overlook the importance of quality materials used to make their iSUP. Thus, our board today, and just like many other pioneering brands, is made of heavy duty military grade PVC material that’s globally known for being tough and durable yet impressively flexible in order to handle high pressure and serious beating. Also, the drop stitch technology used on this board ensures a strong core that can take up to 20 psi which results in a super stiff board once fully inflated. Being this stiff contributes directly to the board’s glide and performance in different water conditions. Another thing that tells away an iSUP’s quality is the minuteness of the details and features. The SereneLife iSUP is fully renewed and upgrade to feel and look sharper with all its parts being perfectly glued together. That being said, let’s move and know more about these features. Another thing that tells away an iSUP’s quality is the minuteness of the details and features. The SereneLife iSUP is fully renewed and upgrade to feel and look sharper with all its parts being perfectly glued together. That being said, let’s move and know more about these features. For a starter, the SereneLife iSUP got a great traction pad update; the cushioned non-slip soft top covers half the board’s back allowing you to be completely in control of your body – especially if you are a beginner -, which means you’ll easily hold a grasp of how the whole thing works. Another thing that we could’ve started with is the little fact that the SereneLife Premium iSUP comes in 4 different colors; Orange, Pink, Aqua and Blue. It’s simple; this iSUP is made for both men and woman to enjoy different water activities. Next, you’ll find a trio-fin navigation system which is personally my all time favorite. This system is an essential feature that leads to any board being extremely versatile. 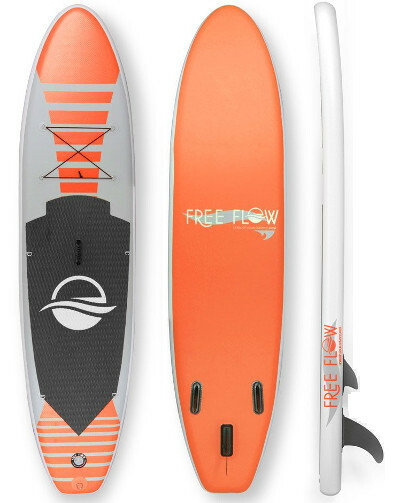 The large removable fin is designed to cut through water for smooth and straight water tracking while the other 2 fixed fins contribute to the board’s balance and overall performance. Also, there is a central carry handle that’ll allow you to use one single hand to carry the inflated board. It’s super practical and in case you fell into water, you can hold on to it until you get back on the board. What’s more important here is the storage area; the SereneLife iSUP is featured with 4 stainless steel D-rings with a bungee cord on the front to secure any needed cargo on board. There are another 4 D-rings surrounding the traction pad, and you can assume what they’re good for; you can attach a kayak seat if you have one to paddle your way while sitting comfortably and enjoying what’s around you. The last D-ring you need to know about is on the board’s tail so you can attach the package-included safety leash. 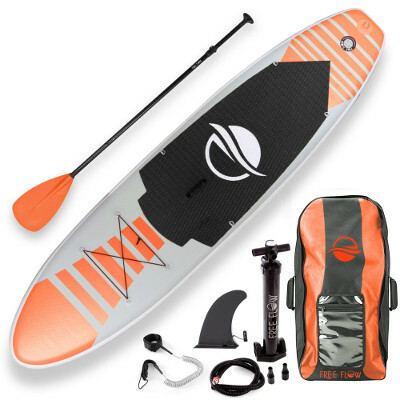 I’m pretty sure that we have already mentioned that the SereneLife iSUP is perfect for beginners and first time paddlers given its relatively wide body that provides plenty of stability and control. However, we can all agree that this board could also be a good choice for intermediate level riders who are up for some fun. 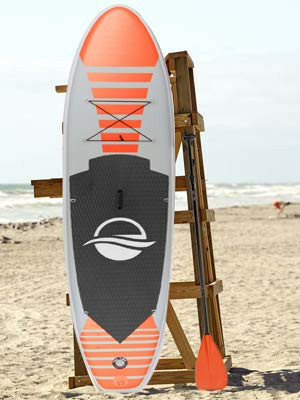 The SereneLife Premium iSUP is a versatile board that can be used in lakes, rivers and oceans like the company suggests. Now having tested it, we can only confirm; this board is capable of delivering very smooth water tracking especially in flat water, while it’ll also support whatever maneuvers you want to pull on a river or on some waves. In terms of speed, we can’t promise you a racing speed board but you’ll get what’s good enough for an all-round iSUP that can handle quite a weight and different water conditions. 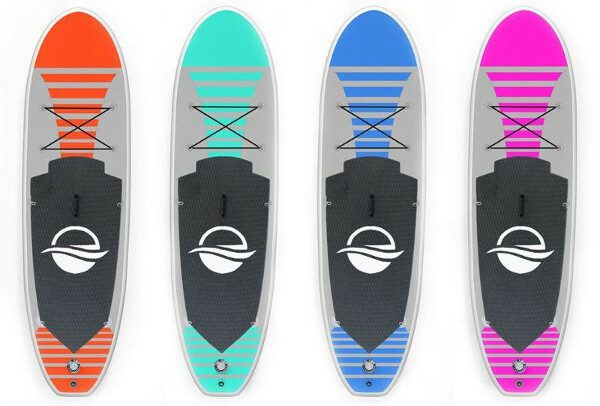 The SereneLife iSUP comes with an adjustable 3-piece paddle that matches the board’s color. A carry backpack for comfortable and practical transportation. A hand air pump with gauge, handles and air host. The SereneLife Premium iSUP comes with a perfectly complete package. It’s featured with enough D-rings for both the storage area and any extra attachments. It’s very stable making it perfect for beginners. It’s highly and easily maneuverable for more fun in playful waters. So far so good; the SereneLife iSUP gave us nothing to complain about, and to be honest, there is no way you’d go wrong with such a standard and fully equipped board.